You already know how the AirFlow Breeze register vent booster fan can make “problem rooms” more comfortable. The AirFlow Breeze Ultra has been designed with several exciting, new features while maintaining the same automatic on/off function and built-in temperature sensor you love in the AirFlow Breeze. And, it still costs only about $5 per year to operate! Like the Airflow Breeze, the AirFlow Breeze Ultra can simply slide into a floor register vent and be plugged into a standard outlet for easy installation. The new AirFlow Breeze Ultra fits vents measuring 6”x10” or 6”x12” and, for those homes with wall or ceiling vents, it can be easily installed by simply drilling two holes and attaching the AirFlow Breeze Ultra to the surface with screws. The 6-foot power cord can be run from the front or back of the unit, or it can be hardwired so no cord is visible at all. Another feature unique to the new AirFlow Breeze Ultra is the remote control operation! It makes it easy to apply settings to the register vent booster fan in those hard-to-reach places, especially on, or near, the ceiling. The new three-speed fan of the AirFlow Breeze operates at a soft whisper level of 32-35 dBA. Besides the quiet operation, with three speeds, you can determine how much airflow you want in the room and adjust it to meet your comfort level. The new AirFlow Breeze Ultra register vent booster fan builds on the great features of the AirFlow Breeze to give you more versatility with ease of use and individual comfort in mind! For energy savings tips, consumer hints and product information visit our AFT BLOG TODAY!! Uncomfortable in rooms in your house? Temperatures vary widely going from room to room? AirFlow Technology has been thinking about all that, too! Solve problems! Be Comfortable! Save BIG money! Install an AirFlow Breeze Ultra today! Problem:The family room in your house is too warm during the summer months. You have two solution options. Solution No. 1. Turn down the temperature on the thermostat 3º - 5º F.
Result:Family room temperature goes down, room is more comfortable, but other rooms are cold. Electricity bill increases 20% (average of $100 per year). Solution No. 2. Purchase and install an AirFlow Breeze Ultra in existing register vent. Result: Family room temperature goes down 3º - 5º F. After initial purchase price, cost is $5 per year. As you can see, even in the first year you will save money! Each year you save more and by the time the fifth year rolls around, you have saved some BIG BUCKS. These numbers are based on existing national averages now. Imagine how much more you will have saved with annual utility cost increases. The chart reflects only the savings for the summer months. The AirFlow Breeze and AirFlow Breeze Ultra work hard all through the year, so your savings will grow even more if you include the winter months as well! When you compare cost and savings, there really is only one practical solution, isn’t there? Visit Airflow Technology today to pick out the unit in the color that matches your décor best! Use Room-to-Room Transfer to cool two rooms for the price of one! Not only is the AirFlow Breeze Ultra great for boosting the cool air from the central air conditioning system, it is a great way to cool MORE THAN ONE ROOM when you use window air conditioning units!! In an adjacent room, the AirFlow Breeze Ultra can be installed in a new (or existing) wall vent opposite an existing (or new) wall vent in the room with the window AC unit. Once installed and operating, the AirFlow Breeze Ultra pulls the cool air from the air conditioned room into the adjoining room. For much less than the cost of another window air conditioner, the adjoining room’s temperature drops and becomes much cooler! It’s another brilliant idea from AirFlow Technology to help you save money and be more comfortable in every room of your house. 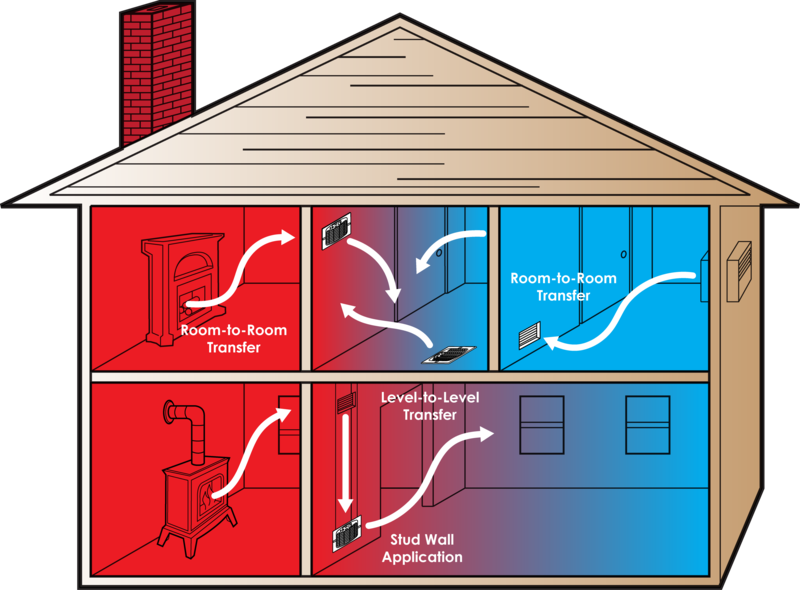 Take a look at the Room-to-Room Transfer illustration below for more innovative ways to use the AirFlow Breeze or AirFlow Breeze Ultra in your home! Turn Problem Rooms Into Comfortable Rooms with the New AirFlow Breeze Ultra!